1.) Bare Minerals Warmth >> i have tried tons of bronzers in my day & i still always find myself going back to the bare minerals warmth bronzer. back in high school i would dust this stuff ALL over my face, but now i use it to just add some 'warmth' to certain areas on my face. it works wonderfully & doesn't clog my pores. this color also works on just about everyone's skin tone & you can use as much or as little as you want to get that perfect glow! 2.) Maybelline Pink Punch Baby Lips >> i love baby lips. i use the clear, peppermint one as a chapstick but recently bought the bright pink one to use as a light lip stick. i am so obsessed with this product because i suffer from terribly dry lips. when i use normal lipsticks i tend to get cracks or weird coverage due to dry lips, but baby lips is great because it is a chapstick with pigment! so if you need to hydrate your lips but still want some color, try pink punch! 3.) MAC Fluidline >> i am a sucker for the cat eye look. i love a nice little wing coming off of the top eye lid. 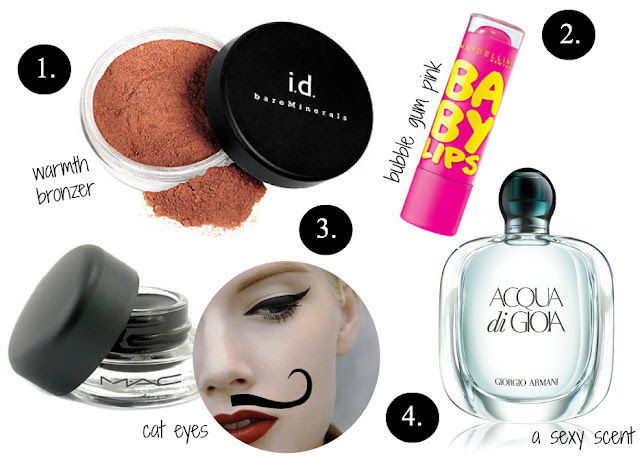 i have been using MAC's fluidline gel eyeliner for a long time now & this stuff is just great. all you need is an angled or a really thin makeup brush to apply it & you can create any sort of cat eye you like! or if you aren't into the cat eye look it is great for making a nice solid line or even a mustache ;). i always get this gel liner in black, but they have brown & fun colors as well. 4.) Acqua di Gioia >> i am a perfume girl. i enjoy smelling good & getting compliments about my perfume. of course i am a fan of the ever so popular chance by chanel, but you don't want to smell like everyone else in the room, do you? i love acqua di gioia because it isn't found all over the place. i always get compliments when i am wearing it & most of all, my husband loves it. i had to stop wearing my favorite perfume a couple years ago after mark told me i smelled like a grandma :( sad day. but since then i have used multiple perfumes & have found acqua di gioia to be one of my all time favorites.